This is a graphic organizer used by students to help facilitate communication between the classroom and home. Students fill it out each day to take home and show their parents. Students are reminded of what they need to complete for homework (either work not finished in class or assigned as homework). Now, when parents ask their child what they did in school all day, the student can't answer, "Nothin'." 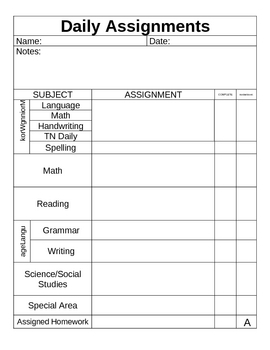 I usually begin the school year having the Assignment Sheet mostly filled out for the students. As the year (and the students) progress, I have them fill out more and more of it, until by the end of the year, they are completing it on their own. This does require a posted list of activities/objectives that students will complete each day somewhere in the room so they can copy it down before they pack up.